Some would say the number 12 is a special number. There are 12 months in a year, 12 days of Christmas, 12 folds in the U.S. Flag Folding Ceremony and 12 people have walked on the moon. 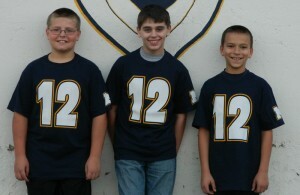 But for three boys from McDonald, the number 12 takes on an entirely new meaning this year – they’re all turning 12 on Dec. 12, 2012. The Haslinger Family Pediatric Palliative Care Center is turning 10, and we want to share our party hats, balloons and cake with you!